In 2015, the USGBC began its shift to a performance-based platform for LEED Operations & Maintenance (O+M) certifications. Formerly known as LEED Dynamic Plaque and Performance Score, this certification pathway is now officially called “LEED v4.1.” Since its launch last year, the USGBC has fine-tuned v4.1 to incorporate industry feedback. Arc v3.0: Arc is the performance-based online platform that drives v4.1 O+M certifications. Last weekend, the USGBC updated the Arc scoring metrics and algorithm as part of their Arc v3.0 rollout. 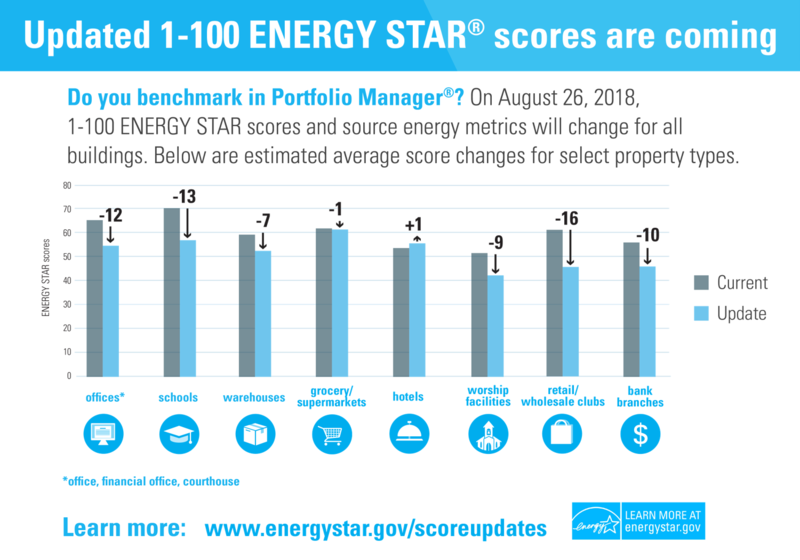 After the updates, we saw most property performance scores increase by 5+ points. Certification period: Properties are now required to formally submit for recertification every 3 years instead of annually. However, building performance data must still be uploaded annually to Arc. Projects that do not update their data annually will no longer be considered certified and will have to repay registration fees when recertifying next. Certification fees: The USGBC has prorated their 5-year recertification fees to 3-years to align with the new cycle. Note that the $/year has not changed. Properties can pursue recertifications through “LEED v4.1 Recertification” by entering annual performance data (e.g., energy, water, waste, IAQ testing and survey results) into Arc and generating a performance score. Initial certification can be achieved through “LEED v4.1 O+M” by entering annual performance data into Arc AND demonstrating compliance with basic LEED prerequisites and optional "base" points. Once initial certification is achieved, properties then pursue “LEED v4.1 Recertification” to maintain their certification. Is traditional O+M certification still available? Yes, the traditional approach that follows a five-year cycle is still available. However, it will likely be phased out soon because the USGBC has pivoted to performance-based certifications with v4.1. From our experience, LEED v4.1 is much more streamlined than the traditional approach and reduces certification costs by an average of 25-40%. This entry was posted in Market Trends. Bookmark the permalink. I simply want to say I am beginner to blogging and site-building and really loved this website. More than likely I’m likely to bookmark your blog . You really have fantastic article content. Kudos for sharing your webpage. My husband and i got very delighted Emmanuel could complete his survey from your ideas he gained while using the web pages. It’s not at all simplistic to just choose to be giving for free tips and hints people could have been selling. And we figure out we have the blog owner to be grateful to for that. The main explanations you made, the straightforward blog menu, the friendships you will assist to engender – it is mostly excellent, and it’s making our son in addition to the family do think the situation is satisfying, and that’s pretty indispensable. Thank you for everything! Thank you for sharing excellent informations. Your web-site is very cool. I’m impressed by the details that you¡¦ve on this site. It reveals how nicely you perceive this subject. Bookmarked this website page, will come back for more articles. You, my pal, ROCK! I found simply the info I already searched everywhere and simply could not come across. What a great website. Hi, i have a complimentary wordpress blog site. I have added the widgets that can be found in the widget section. But just how do i include widgets that are from 3rd parties such as clustrmaps? If cost-free wordpress blog sites do not allow that, which free blog solution allows that?.